Stories On Human Rights, an evening of film screenings, will take place at the FCCT in Bangkok on 4th May. The films were commissioned by the United Nations, and the programme includes Apichatpong Weerasethakul's Mobile Men. Apichatpong will be present for a Q&A session after the screenings. 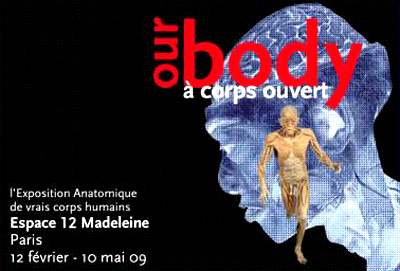 Our Body: A Corps Ouvert, an exhibition of seventeen plastinated human corpses, has been closed down on the orders of a French court. It opened in Paris on 12th February, and was due to run until 10th May, though a judge ruled that it was a disrespectful use of human cadavers. The exhibition features real bodies with exposed muscles, and is one of several imitators of the original Bodyworlds exhibition, which opened more than a decade ago. This chronological list was compiled by Turner Classic Movies last week. I would only quibble with a couple of their choices: is It Happened One Night really necessary on such a short list, and surely Stagecoach could be removed if The Searchers is included? Also, nothing from Stanley Kubrick, Ingmar Bergman, Francis Coppola, or Jean Renoir. Chulalonghorn University's Art Centre will host an exhibition by Australian artist Arlo Mountford later this month. The show, titled The Hacienda Must Be Built, opens on 21st April and closes on 30th May. 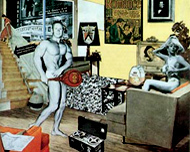 It features Mountford's video installation Return To Point, which consists of animations based on canonical artworks, including a Richard Hamilton collage (Just What Is It That Makes Today's Homes So Different, So Appealing?). Two residents of Bangkok's Nang Loeng district have been shot dead by United front for Democracy against Dictatorship protesters. Residents in several districts, especially tenants in Din Daeng apartments, have clashed with the UDD in Bangkok today. The red-shirted UDD movement originally prided itself on protesting peacefully and legally, in stark contrast to the yellow-shirted People's Alliance for Democracy. The UDD's demands (for the army and Privy Council to stay out of politics, for the violent PAD protesters to be prosecuted, for the reinstatement of the 1997 'people's constitution', and for a new general election) are justified, though of course they are likely to lose any public sympathy after the violence yesterday and today. Early this morning, the army began advancing on a group of demonstrators at the Din Daeng intersection near Victory Monument, firing shots into the air from M16 rifles. After several hours, and dozens of injuries, the protesters dispersed. UDD leaders claimed that six protesters were killed, a rumour which Thaksin repeated in live CNN and BBC interviews this evening. Also on CNN, Thaksin pleaded for royal intervention: "I humbly urge His Majesty the King to intervene, please". Prime Minister Abhisit Vejjajiva declared a state of emergency in Bangkok yesterday, and the UDD reacted by raiding several government ministries and attacking the PM's car. Several buses and gas tankers have also been hijacked by UDD demonstrators. Jacob Zuma, President of South Africa's ruling ANC party, is suing cartoonist Jonathan Shapiro (known as Zapiro) for libel. 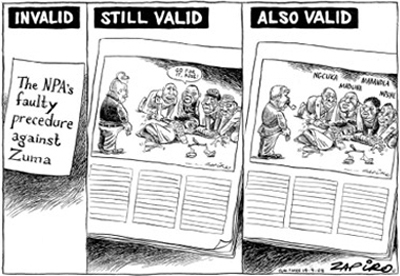 Shapiro's cartoon was published in the Sunday Times newspaper on 7th September 2008, and on the front page of its sister paper The Times two days later; it was also broadcast on CNN last month (African Voices, 22nd March).